You may have never heard of blue-green algae toxicity in dogs before, but it's a real health threat in the summer and fall and during times of drought. Learn more about this toxic condition, how to spot a contaminated water source, and how to keep your dog safe. Incidents of blue-green algae toxicity in dogs were widely reported due to the drought that plagued a great portion of the USA in 2007. Reports from the Minnesota lake regions alone included as many as 40 cases of canine algae poisoning. At the time, four deaths had been reported in that region, but this number only pertains to the known cases. There could have been more deaths that were not attributed to algae poisoning because pet owners were not aware their dogs had been exposed to the contamination. Dogs develop algae poisoning when they drink from contaminated water sources. The algae produce toxins that affect the dog's internal organs and depending on the concentration of algae in the dog's stomach, the animal can die immediately or succumb later from a variety of symptoms. In times of drought, lowered water levels and low air circulation combine to boost production of algae into overdrive. Normally, algae are equally distributed throughout the water, but large blooms are often followed by large die-offs. The gas produced by these die-offs pushes the algae colony up to collect at the water's surface, creating a dangerous situation. The signs of algae toxicity in dogs vary, depending on whether they are triggered by nervous system toxins (anatoxins) or liver toxins (microcystins). Signs will appear quickly with only a 30 to 60 minute time frame after your dog has ingested anatoxins, including death. Dogs that have taken in microcystins will show signs over the course of a few hours and a dog can die 12 to 24 hours later. If you think your dog has been exposed and you see these signs get to a vet immediately. In order to diagnose algae poisoning, a vet will take into consideration the dog's symptoms and a history of where the dog has recently been. Most dogs will display telltale blue-green staining on the muzzle if they have recently drunk from algae contaminated water sources, and this can contribute greatly to the diagnosis. Treating a case of blue-green algae poisoning is difficult at best, so it's extremely important to take action quickly if you believe your dog has been exposed. If a dog manages to survive a blue-green algae poisoning, he will experience lasting effects over the rest of his life. This is due to the damage to their liver during the initial poisoning that unfortunately cannot be reserved. Preventing blue-green algae toxicity in dogs is easier than successfully treating it. 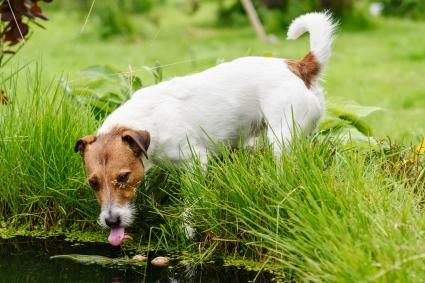 The best advice is to not allow your dog to drink from stagnant water, ponds or lakes, especially if they have a bluish-green scum on the surface and around the edges. The bacteria that forms blue-green algae are microscopic but you can tell if it's present by the striking green color. However, because the color is not always exact, veterinarians advise keeping your dog away from any body of water with algae to be safe. Even algae in your fish tanks can be harmful if your dog is able to drink it. 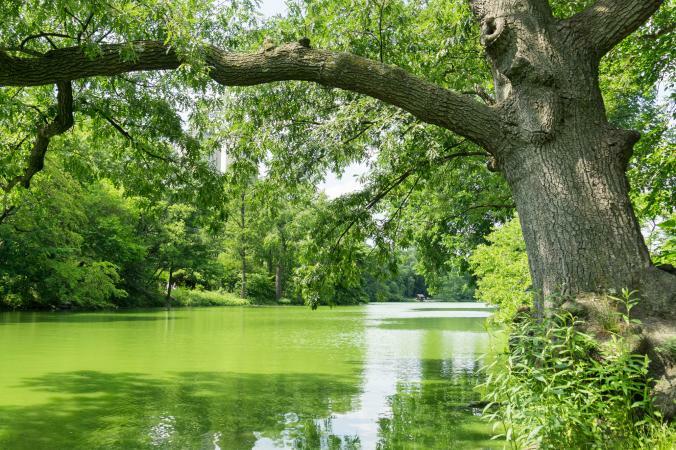 Hot weather is the prime "blue-green algae season." If you tend to have your dog out around stagnant bodies of water during the middle of the summer to early fall, you should be much more wary of the chances of your dog becoming exposed. While blue-green algae can occur any time of the year, the hottest months of the year are the most likely to produce the necessary conditions for blue-green algae growth. Areas of North America that have generally warmer, more humid climates are more likely to have longer seasons where blue-green algae are present. Although all blue-green algae should be treated with suspicion, there are many strains and not all of them produce toxins. In the long run, it's better to err on the side of caution and keep your dog away from any water you have reason to believe is contaminated.